The Huckleberry Hound Show was a syndicated animated series which began airing in 1958 and the second from the Hanna-Barbera studios following The Ruff and Reddy Show, sponsored by Kellogg's. Three segments were included in the program: one featuring Huckleberry Hound, another starring Yogi Bear and his sidekick Boo Boo, and a third with Pixie and Dixie and Mr. Jinks, two mice who in each short found a new way to outwit the cat Mr. Jinks. The Yogi Bear segment of the show became extremely popular and, as a result, it spawned its own series in 1961. A segment featuring Hokey Wolf and Ding-A-Ling was added, replacing Yogi during the 1960–61 season. The show contributed to making Hanna-Barbera Productions a household name, and is often credited with legitimizing the concept of animation produced specifically for television. In 1960, it became the first animated program to be honored with an Emmy Award. Joseph Barbera went to Chicago to pitch the program to Kellogg's executives through their ad agency, Leo Burnett. "I had never sold a show before because I didn't have to. If we got an idea, we just made it, for over twenty years. All of a sudden, I'm a salesman, and I'm in a room with forty-five people staring at me, and I'm pushing Huckleberry Hound and Yogi Bear and 'the Meeces', and they bought it." The series featured three seven-minute cartoons, animated specifically for television. The first always starred Huckleberry, the next two featured other characters. The show was originally intended to part a line-up of kid programmes sponsored by Kellogg and broadcast on ABC-TV, joining Woody Woodpecker, Superman and Wild Bill Hickok in an early evening, weekday line-up. However, Kellogg's agency, Leo Burnett, decided instead to syndicate the show and buy air time on individual stations. The show was originally distributed by Screen Gems, which held a part-ownership of Hanna-Barbera at the time, over 150 stations. In April 1967, Screen Gems announced the show had been released from advertiser control, and would be made available to stations on a syndicated basis with available bridges to create 92 half-hour shows. The distribution was later passed to Worldvision Enterprises, after it became a sister company to Hanna-Barbera. It was later distributed by Turner Program Services, after Turner's purchase of Hanna-Barbera; current distributor Warner Bros. Television picked up ownership of the show following the 1996 acquisition of Turner by parent company, Time Warner. The show was not broadcast on the same day of the week, or the same time, in every city; airing depended on the deal for time that the Leo Burnett Agency brokered with individual stations. However, the first time the Huck series appeared on television was on Monday, September 29, 1958; it was seen at 6 p.m. on WOOD-TV in Grand Rapids, Michigan, which also served Battle Creek, home of Kellogg cereals. Another of the stations airing it that day was WLWI in Indianapolis (at 6:30 p.m.) The show debuted on other days that same week in other cities; Huck originally aired in Los Angeles on Tuesdays, Chicago on Wednesdays and New York City on Thursdays. The show first aired in Canada on Thursday, October 2, 1958 at 7 p.m. on CKLW-TV in Windsor, Ontario. Each of the three segments featured one or two main characters acting as a duo, and numerous one-off or supporting characters. 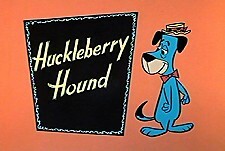 Huck's voice was one that Butler had already developed and used in earlier work, such as the dog character in The Ruff and Reddy Show, Smedley the Dog in Chilly Willy cartoons, and earlier characters in the MGM cartoon library. It was said to be based on the neighbor of his wife, Myrtis; Butler would speak with said neighbor when visiting North Carolina. Yogi Bear (voiced by Daws Butler impersonating Ed Norton from the Honeymooners) and his friend Boo Boo Bear (voiced by Don Messick) live in Jellystone Park and occasionally try to steal picnic baskets while evading Ranger Smith (voiced by Don Messick). Yogi also has a relationship with his girlfriend Cindy Bear (voiced by Julie Bennett). Pixie (voiced by Don Messick) and Dixie (voiced by Daws Butler) are two mice who every day end up being chased by a cat named Mr. Jinks (voiced by Daws Butler impersonating Marlon Brando). Hokey Wolf (voiced by Daws Butler impersonating Phil Silvers) is a con-artist wolf who is always trying to cheat his way to the simple life (much like other Hanna-Barbera characters, Top Cat and Yogi Bear). He is accompanied in this by his diminutive, bowler hat-wearing sidekick Ding-A-Ling Wolf (voiced by Doug Young impersonating Buddy Hackett). In 1960s Hungary, the series - there called Foxi Maxi - gained an instant cult following, also among adults. The reason for this was the fact that legendary scriptwriter József Romhányi had penned dialog with his trademark puns and humor, and some of the most popular actors of the day had supplied the voices. The original Hungarian dubbing of the show remains a cult classic to this day. Romhányi and some of the same actors later went on to create a similar cult classic with the Hungarian version of The Flintstones. On November 15, 2005 (2005-11-15), Warner Home Video (via Hanna-Barbera Cartoons and Warner Bros. Family Entertainment) released The Huckleberry Hound Show – Volume 1 for the Hanna-Barbera Classics Collection, featuring the complete first season of 26 episodes (66 segments) from the series on DVD, all presented un-edited, uncut, remastered and restored. The characters from The Huckleberry Hound Show spawned various product, publishing, and other licensing deals. Columbia Pictures/Screen Gems' record arm, Colpix, released the first Huckleberry Hound album in October 1958, with stuffed animals and games also hawked in record stores. No later than 1961, the characters began appearing "in person" at events across America. Hanna Barbera commissioned costumed characters of Huckleberry Hound, Yogi Bear, and Quick Draw McGraw, which appeared at events like the Florida State Fair. Hanna-Barbera owner Taft Broadcasting started opening theme parks in 1972, beginning with Kings Island. These parks included areas themed to the company's cartoons, and included walk-around characters of Huckleberry Hound, Yogi Bear, and others. The characters were also featured on rides, including carousels. Licensed Huckleberry products included an Aladdin-brand Thermos. Huckleberry Hound Christmas, P. Scherr, Golden Press, 25 cents. Huckleberry Hound: The Case of the Friendly Monster, Ottenheimer Publishers, 1978, 96 pages. ^ "Musicnotes.com: Huckleberry Hound". musicnotes.com. Madison, WI: Musicnotes, Inc. Retrieved 2008-10-20. ^ Mallory, Michael. Hanna-Barbera Cartoons. New York: Hugh Lauter Levin Associates, 1998. ISBN 0-88363-108-3. p. 44. ^ "Animation legend William Hanna dies at 90". CNN.com/Entertainment. 2001-03-23. Archived from the original on 2008-05-15. Retrieved 2008-08-06. ^ a b Tim Lawson; Alisa Persons (December 2004). "Daws Butler". The Magic Behind the Voices: A Who's who of Cartoon Voice Actors (Scan)|format= requires |url= (help). Jackson, MS: University Press of Mississippi. p. 367. ISBN 1-57806-696-4. Retrieved 2008-10-20. ^ Edward Stasheff, Rudy Bretz (1962) . The Television Program (Scan). Hill and Wang. p. 335. Retrieved 2008-10-20. ^ Lansing State Journal, Sept. 27, 1958, pg. 20. ^ Tipton Tribune, Sept. 29, 1958, pg. 6. ^ Chicago Tribune, Sep. 27 1958, pg. c16. ^ Green, Jonathon (2005) . Cassell's Dictionary of Slang (Scan). New York, New York: Sterling Publishing Company. p. 1565. ISBN 0-304-36636-6. Retrieved 2008-10-20. ^ "Video Games, Wikis, Cheats, Walkthroughs, Reviews, News & Videos - IGN". IGN. Archived from the original on 2009-03-01. ^ "Huckleberry Hound To Be At Gasparilla" (Scan). St. Petersburg Times. St. Petersburg, Florida: The Times Publishing Company. 1961-02-12. Retrieved 2008-10-20. The Big Cartoon Database – Informational site and episode guides on The Huckleberry Hound Show. The Cartoon Scrapbook – Information and details on Huckleberry Hound. This page was last edited on 19 April 2019, at 07:51 (UTC).